A team of Indian and British astronomers have predicted the likely shape of the Sun’s corona during the total solar eclipse on Monday. If the prediction comes true, it will mark a major scientific achievement and could facilitate forecasting of space weather in future. Using computer simulations, a team led by led by Dibyendu Nandi of Centre of Excellence in Space Sciences India (CESSI) has predicted the shape and structure of solar corona, the upper atmosphere of the sun, which consists of hot ionised gases. The prediction of the structure of the solar corona is expected to help better forecast of space weather, which impacts satellite operations, telecommunications, GPS navigational networks and electric power grids on the earth. In addition, it could provide clues to resolving the enigma of the million degrees solar corona, called the ‘coronal heating problem’. Due to intense glare of the Sun, its corona is normally not visible. 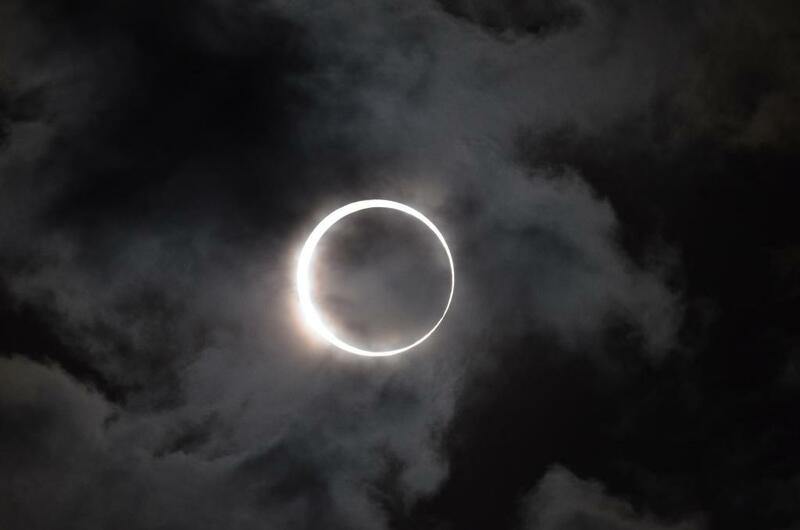 But during the fleeting moments of total eclipse when the moon perfectly hides the disc of the sun, the enchanting corona is visible in all its glory. Solar physicists travel across the globe to witness total solar eclipse mainly to get a peek into the corona. The magnetic state of the Sun determines shape of the corona. Magnetic fields cannot be observed directly, but when iron filings are sprinkled over a bar magnet, butterfly shaped invisible magnetic lines appear abruptly. In the same way, the super-heated ionised gases present in the Sun's atmosphere trace out its magnetic field lines. Earlier studies have established faint straight structures protruding from the north, and south poles called polar plumes, and petal like structures called helmet streamers. “During the magnetically ‘calm’ phase, with very few sunspots on the surface, called ‘solar minimum’ like this year, the corona has a relatively simple structure. Seen from earth the magnetic lines look like a pair of wings extending outward from the equatorial region of the Sun. On the other hand, during the ‘stormy’, magnetically active phase, say as was in 2012, called ‘solar maximum’, with lot more active sunspots, the corona is complex and chaotic with dense regions called streamers bursting forth in a haphazard fashion from all latitudes on the Sun,” explained Niruj Mohan Ramanujam, Chairperson of the Astronomical Society of India's Public Outreach and Education Committee. Predicting the coronal structure is crucial as it would help infer the different aspects of solar wind. During solar minimum, solar wind blows from the equatorial region of the sun at 400 km/sec, while from the polar region the wind gushes out at nearly 700 km/sec. During the solar maximum, in turn, scrambled magnetic fields result in a stronger solar wind from all region of the Sun. “If we can predict the size and shape of the solar corona then we can infer about the solar wind, its strength and so on,” says Ramanujam. The team has come up with computer simulated prediction for the shape of solar corona expected during this eclipse by using the past data on the solar corona collected during earlier eclipses, applying the existing knowledge of solar physics, and counting the present number of sunspots. “This is only the first time we are attempting this grand challenge and there is only another group which has attempted this earlier. If the prediction comes true, we will have to start moving forward and push our solar computer models to do other challenging tasks like predicting the occurrence of solar storms and severe space weather,” Dr Nandi added. On March 10, 1989, a powerful explosion on the sun resulting from tangled magnetic forces had released a billion-ton cloud of solar plasma into space. The ionised plasma wind struck Earth's magnetic field three days later, setting off a violent 'geomagnetic storm'. This led to disturbance in electrical grid network in Canada causing a complete blackout in that country. “Just as a fall in the barometer indicates an approaching storm, predicting the shape of the corona could lead us to improve the forecasting of such intense geomagnetic storms," Dr. Ramanujam says. Besides, a major mystery about the Sun remained unresolved: How come the corona, the upper atmosphere of Sun, is at about a million degrees Celsius, much hotter than the Sun's surface? If the prediction comes true, this mystery could also get unravelled.